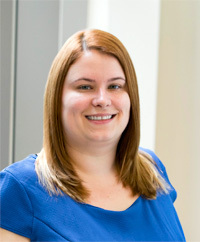 Angela McCue, senior manager of field operations, is responsible for all aspects of the data collection requirements for Applied Marketing Science’s (AMS) primary research projects both in the U.S. and internationally. Her marketing research experience spans many industries such as animal health, high-tech products, industrial products, consumer packaged goods and financial services. She has also been trained as a moderator through the Market Research Society (MRS) and has almost 10 years of moderation experience with consumers, doctors, and business professionals in several markets including personal and animal health, telecommunication products, industrial products, consumer packaged goods and financial services. As the senior manager of field operations, she works with field agencies to collect specific project data and maintain the integrity of sampling sources and procedures. Within AMS, Angela works closely with AMS managers and analysts to design and oversee the data collection phase for all quantitative and qualitative projects, including focus groups, one-on-one interviews, ethnographies, mall intercepts, street intercepts, telephone studies and on-line surveys. Prior to joining AMS, Angela was a senior insight executive at Kadence International, where she managed qualitative and quantitative research projects, which included coordinating fieldwork, conducting focus groups, executing statistical analysis of data, and report writing. Angela also trained and mentored other research professionals at Kadence International. Additionally, she serves as the Director of Sponsorships on the board of the New England Marketing Research Association. Outside of the office, Angela likes to read, travel, play almost any kind of game, and bake for friends and family. One of her favorite things to make is coconut macaroons. When travelling, she loves the opportunity to try new and exotic fruits. Angela holds a B.S. from the Isenberg School of Management at the University of Massachusetts where she majored in business administration, with a concentration in marketing and was in the honors program. Angela has her PRC certification from the Marketing Research Association. She also received her M.B.A. with a focus in project management from Endicott College.